The body of the resident, who was not identified, was discovered Friday morning. The dog survived, police said. Police responded to the resident's home at 8:23 a.m. after someone called to report they had not seen the resident since Thursday afternoon, according to a news released issued by New Hampshire Fish & Game and the Marlborough Police Department. After speaking to a neighbor and learning the resident was last seen taking the dog for a walk, police searched the area and found a hole in the ice, about 49 yards from the shore of nearby Meetinghouse Pond. Police found dog and human tracks near the area of the hole and, using binoculars, saw what appeared to be a deceased dog. Jaffrey Fire Department and Troy Police ice rescue teams respondedt o recovered the dog. 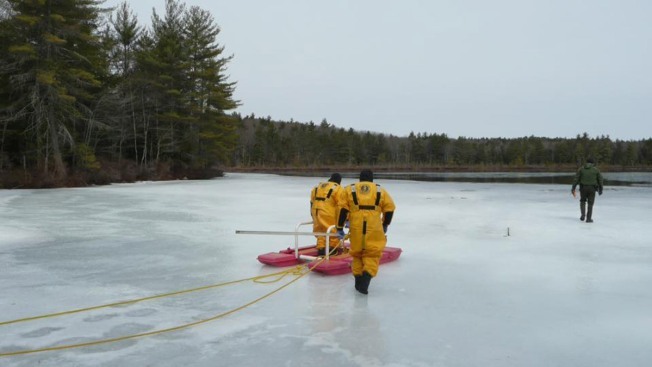 The NH Fish and Game Dive Team recovered the missing resident's body. "It appears that the resident had taken his dog for their usual evening walk out to Meetinghouse Pond," police said. "The dog walked out onto unsafe ice and broke through. The dog's owner retrieved a large pine limb and attempted to rescue his dog." Police said the man drowned in about 12 feet of water.